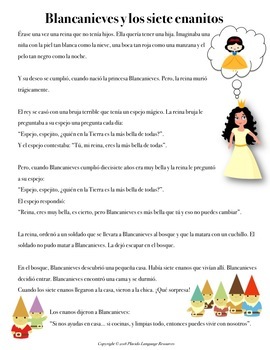 Perfect preview for the Comprehension-Based Reader Bianca Nieves (by Carrie Toth, available at FluencyMatters.com) or to accompany my resource on the Pablo Berger film! 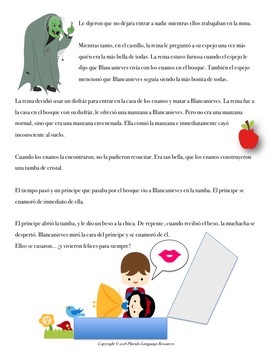 I use this resource with my Spanish 3 classes in the beginning of the year. A set of 24 cards with parts of the story to put in order. When ordered properly, they spell out a secret message! 2 illustrated slideshows of the story, one images only, and one with captions.